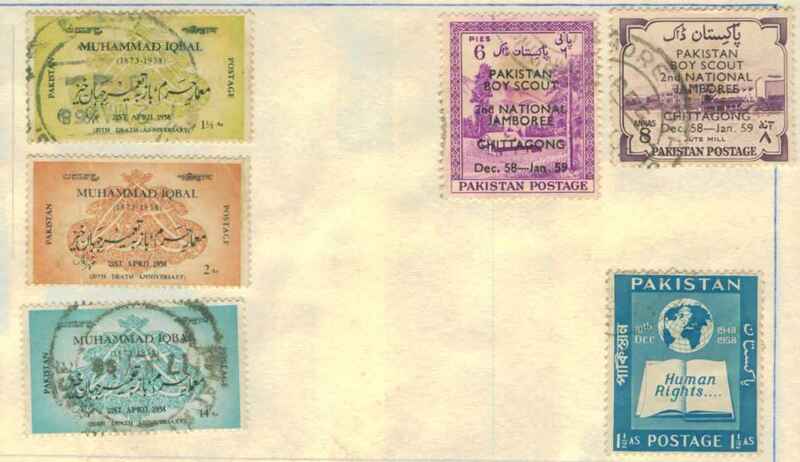 Pakistan Post issued stamps on four occasion during the year 1958 as seen above. The stamp showing a coconut tree in the top row of Rs. 15 denomination was issued on 23 March 1958 to commemorate the second anniversary of Republic Day. Pakistan was declared the first Islamic Republic on 23 March 1956. A set of three stamps in the second row was issued on 21 April 1958 on the eve of 20th death anniversary of Pakistan's national poet Dr Allama Muhammad Iqbal. The stamps had a face value of one and a half ana (left-yellow), 2 anas (centre - orange brown) and 14 anas (left - turquoise blue). 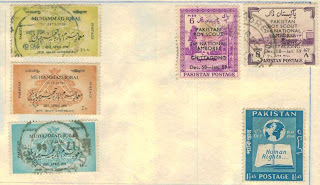 On 10 December 1958, on the eve of 10th anniversary of the Human Rights, Pakistan Post issued a set of two stamps (third row above) of one and a half ana (turquoise blue - left) and 14 anas (sepia - right). 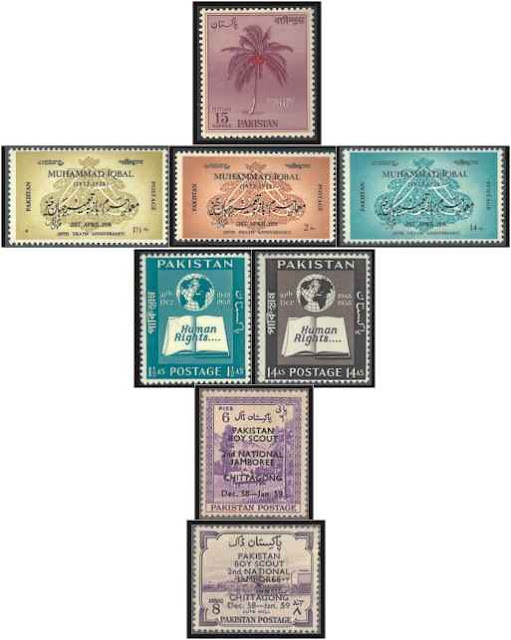 My collection of 1958 is not complete as I do not have stamps of the Republic Day celebrations and the sepia coloured stamp issued to commemorate the 10 anniversary of Human Rights.